In 2011, I set off with a camera to explore a mental asylum in Mexico run by its own patients. 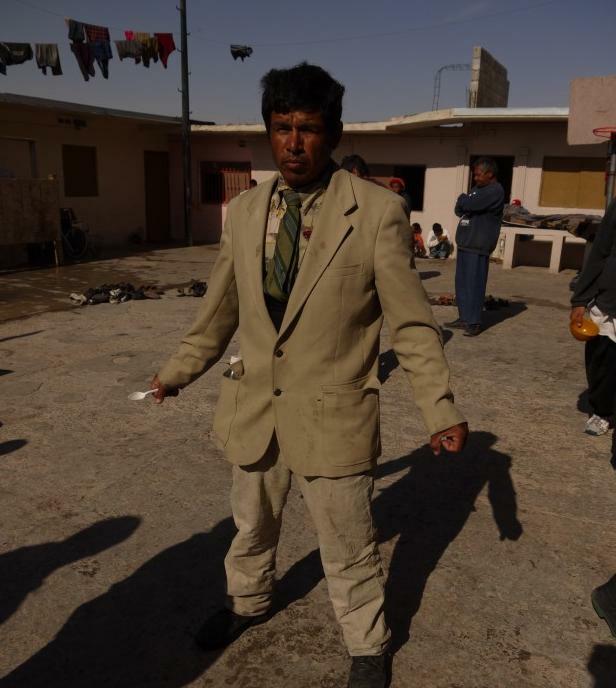 The place is just beyond the last junkyard on the curdled fringe of Juárez, the world’s most violent city. Years ago I’d seen a Russian film called Palms by Artur Aristakisyan. It’s about people conjuring up their own worlds on their own terms while living amongst the detritus of lumpen society. They’re presented as an aristocracy representing freedom. Consciously or not, I’d been seeking out similar people, and all at once I encountered 120 of them running their own asylum in the desert. For more information on the film, please visit deadwhenigothere.org. On one level these people shared a common purpose in that they dressed each other, cleaned each other and fed each other. But then there were many other levels, many other worlds. As there was very little medication available, people were free to incant their nightmares or be amused at apparently nothing at all. The tragicomedy of Beckett was everywhere, ‘I can’t go on, I’ll go on’, while the infantile grotesqueness of Jarry’s Ubu Roi was never far away. I admit I was more than a little afraid but set about to film these people. The more I filmed, the less I understood, and the more curious I became. There will be a live soundtrack performance to Antes Muerte, the prequel of Dead When I Got Here, in London on June 21 – for more details, please go to deadwhenigothere.org. I met a man called Josué who was managing the asylum. Five years previously he’d lost his mind and the ability to walk, but I found him in a reflective mood. He told me his dream. After two visits and many hours of material, my editing was frustrated by a desire to present the mystery I’d encountered while needing a story to hang it on. Then Josué’s dream came true. His daughter in LA emailed me to ask what her father was doing in a mental asylum. She’d seen a trailer for the film I’d posted online. She hadn’t seen her father in 22 years and had been told he was dead. Two more visits and I managed to put Josué and his daughter together and filmed the reunion. I had my story and it had arrived in mysterious ways. Dead When I Got Here unites the oddest of bedfellows: a warm family reunion and the mystery and trauma of mental illness from a city where eight people are murdered every day with impunity. The film is due for completion later this year and we’re inviting people to take part in the process over the month of June. If you’re interested in taking part, please go to the project’s Kickstarter campaign.